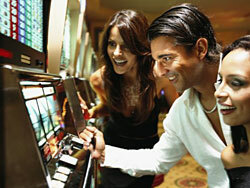 Basic slot machine technology has changed dramatically in the course of slot history. In the rivalry of classical mechanical slot machines and modern computerized slots the latter have almost completely replaced the original models. Nevertheless, the game basics remain the same. To get familiar with the basic slot machine technology it is important to have a short glimpse of the slot history and find out how the main components for slots have changed over time. Until recently, most slot machines were using mechanical reels. The original Liberty Bell slot machine had five reels, but later three-reel machines became standard due to their simplicity and reliability. The biggest drawback of the three-reel slot machines was the limited number of possible symbol combinations - about 1,000 - which limited the chances to get large jackpot as the rarest winning combination would only come out every 1,000 plays. Even as the number of symbols increased to approximately 22, which offered about 10,000 possible combinations, the jackpot sizes were still limited. Modern slot machine technology is defined basically by the computerization of the slot machines technology that began in the late 1980s. It allowed attributing different probability to the symbols on each reel. The reels and the handles have become rudimentary features to the modern slots. The newest slot machine variations - video slots - have no mechanical parts at all. Instead they offer graphical simulation of spinning reels on the video screen, making video slots a kind of a computer game that allows manufacturers to introduce some advanced graphics and bonus games. The outcome of every simulated spin is defined by the central computer installed inside the slot machine. Basic principles defining the modern slot machine technology include the use of the slots Random Number Generator (RNG) to define the outcome of the game. When the player starts the game, RNG delivers random numbers, from "0" to several million or even billion per second. The work of RNG never stops and does not depend on any external factors. It means that the actual outcome of the spins is always random, making the game of slots a game of mere chance. When the player presses the "Spin" button, the next several numbers from the Random Number Generator are processed by the computer program of the slot machine defining the combination of symbols on the reel that is to come out. There is no pre-programming that defines slot machines payouts at a set time. This means that there are equal chances for every given spin of the reels to win or lose.